I am so excited to share this wedding with all of you. I recently had the pleasure of attending a friend's wedding and creating the cake for the event. The wedding was held at the Baltimore Museum of Industry, which is obviously in Baltimore, Maryland. This is such a cool place to have a wedding because the backdrop really displays the Baltimore skyline. Plus, the museum was open during the reception for guests to wander through. How cool is that? Special thanks to the photographer Michelle Deck for providing these photos. 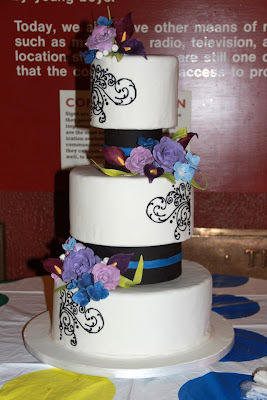 For the cake, the groom wanted it to reflect his career as a police officer. He wanted me to add the thin blue line to the cake, which apparently is a cop thing. The topper also represented his career with an engraving of a pair of handcuffs. Both bride, and groom still wanted the cake to be traditional, and elegant. This was a slight challenge to incorporate the blue line without it being over the top, and the focal point on the cake. I think the cake turned out beautifully, and incorporated both what the bride and the groom wanted. Groom enjoying all of my hard work! I hope you enjoyed this Baltimore wedding! Congratulations Janice and Marty! I am glad I could be a part of your special day! your piping on that cake was flawless! Great job! !